Original-series Star Trek is the only version I’ve ever been able to bring myself to care about. Yet this Star Trek I once cared about a great deal. Doubtless like many of you of a similar age, I grew up with this 1960s incarnation of the show — the incarnation which its creator Gene Roddenberry so famously pitched to the CBS television network as Wagon Train to the Stars, the one which during my childhood was the only Star Trek extant. Three or four Saturdays per year, a local UHF television station would run a Star Trek marathon, featuring nine or ten episodes back to back, interspersed with interviews and other behind-the-scenes segments. Strange as it now sounds even to me in this era when vintage media far more obscure than Star Trek is instantly accessible at any time, these marathons were major events in my young life. I particularly loved the give and take on the bridge of the starship Enterprise during episodes such as “Balance of Terror,” which were heavily inspired by the naval battles of World War II. Upon realizing this, I became quite the little war monger for a while there, devouring every book and movie I could find on the subject. Even after it had slowly dawned on me that in the final reckoning the death and suffering brought on by war far outweigh any courage or glory it might engender, the fascination with history which had been thus awakened never died. I loved the Star Trek movies of the 1980s as well. Young though I was, I recognized the poignancy inherent in watching the now middle-aged cast cram their increasingly substantial frames back into the confines of their Star Fleet uniforms every couple of years. Yes, this made effortless fodder for the late-night comedians, but there was also a wry wisdom to these movies that one doesn’t usually find in such blockbuster fare, as the actors’ aging off-screen selves merged with their onscreen personas in a way we don’t often see in mainstream mass media. Think, for example, of the scene in Star Trek II: The Wrath of Khan where McCoy comes to visit Kirk and present him with his first pair of reading glasses. Decades before I fully understood what that moment — not to mention an expanding middle-aged waistline! — means in real life, I could sense the gravitas of the scene. I credit this side of Star Trek with showing me that there is as much drama and interest in ordinary life as there is in fantastic adventures in outer space. It primed me for the evening I begrudgingly opened Ethan Frome for my English class, and proceeded to devour it over the course of the next several rapt, tear-streaked hours. My English teacher was right, I realized; books without any spaceships or dragons in them really could be pretty darn great. Some years later, I took my bachelor degree in literature. It must have been about the time I was discovering Ethan Frome that Star Trek: The Next Generation debuted on television. Like most of my peers, I was hugely excited by the prospect, and tuned in eagerly to the first episode. Yet I was disappointed by what I saw. The new incarnation of the Enterprise seemed cold and antiseptic in comparison to the old ship’s trusty physicality. Nor did I care for the new crew, who struck me as equally bland and bloodless. Being smart enough even at this tender age to recognize that fictional personalities, like real ones, need time to ripen and deepen, I gave the show another chance — repeatedly, over the course of years. But it continued to do nothing for me. Instead of Wagon Train to the Stars, this version struck me as Bureaucrats in Space. All of this, I’ll freely admit, may have more to do with the fact that The Next Generation came along after I had passed science fiction’s golden age of twelve than anything else. Nevertheless, it does much to explain why I’m the perfect audience for our subject of today: the two Star Trek adventure games which Interplay made in the early 1990s. Throwbacks to the distant past of the franchise even when they were brand new, they continue to stand out from the pack today for their retro sensibilities. Fortunately, these are sensibilities which I unabashedly share. 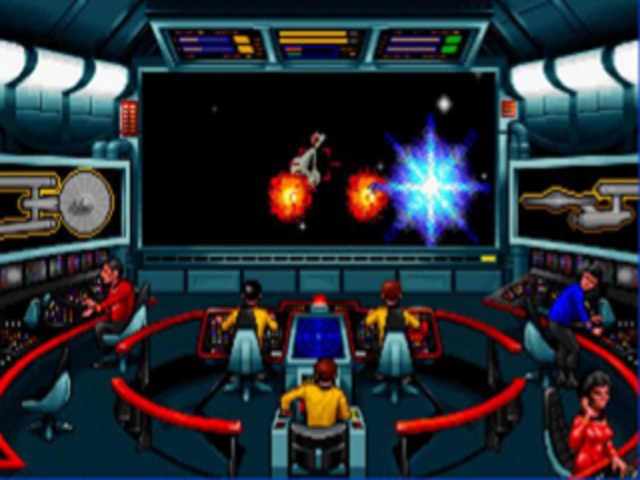 Star Trek hadn’t been well-served by commercial computer games prior to the 1990s. Corporate nepotism had placed its digital-game rights in the slightly clueless hands of the book publisher Simon & Schuster, which was owned, like the show’s parent studio Paramount Pictures, by the media conglomerate known as Gulf and Western. The result had been a series of games that occasionally flirted with mediocrity but more typically fell short of even that standard. Even as each new Star Trek film topped the box-office charts, and even after Star Trek: The Next Generation became the most successful first-run series in the history of syndicated television, Simon & Schuster’s games somehow managed not to become hits. At decade’s end, Paramount granted the rights to a game based on the film Star Trek V: The Final Frontier to the dedicated computer-game publisher Mindscape, but the end product proved little better than what had come before in terms of quality or commercial success. Still, the switch to Mindscape did show that an inkling of awareness of the money all these half-assed Star Trek games were leaving on the table was dawning at last upon Paramount. As the new decade began, the silver anniversary of the original series’s first broadcast on September 8, 1966, was beginning to loom large. Paramount decided to celebrate the occasion with something of a media blitz, anchored by a two-hour television special that would air in 1991 as close as possible to the show’s exact 25th anniversary. For the first time on this occasion, Paramount decided to make digital games into a concerted part of their media strategy rather than an afterthought. They signed a contract with the Japanese company Konami to make a game, entitled simply Star Trek: 25th Anniversary, for the Nintendo Entertainment System, the heart of the videogame mass market, and for the Nintendo Gameboy, the hot new handheld videogame system. Rather than the Next Generation crew or even the original Enterprise crew in their most recent, most rotund incarnations, these games were to wind the clock all the way back to those heady early days of 1966, when Captain Kirk was still happy to appear on camera with his shirt off. That deal still left a space for an anniversary title in the computer-game market. Said market was, it was true, much smaller than the one for Nintendo games, but it was notable for its older, more well-heeled buyers willing to pay more money for more ambitious games. Yet computer-game publishers proved more reluctant to sign on for the project than the broad popularity of the Star Trek brand in general might lead one to believe. It didn’t require the benefit of hindsight to see that the Star Trek franchise, although it was indeed more popular than ever before, was going through a period of transition in 1990. The Next Generation had been on the air for three seasons now and was heading into a fourth; it was thus about to exceed the on-air longevity of the series that had inspired it. Meanwhile the cast of that older series were bowing to the realities of age at last; it had been announced that Star Trek VI: The Undiscovered Country, due for release in late 1991, was to be the last feature film in which they would star. A time when the Next Generation crew would become the default face of Star Trek, the original crew creaky anachronisms, was no longer impossible to imagine. 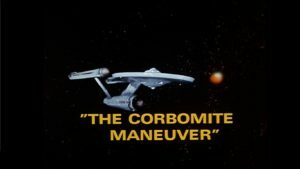 Given this passing of the torch that seemed to be in progress, most computer-game publishers were skeptical of Paramount’s plans for games featuring the original Enterprise and its crew in their youngest incarnations. They felt that this version of Star Trek was already all but dead in commercial terms, what with the success of all of the franchise’s more recent productions. Brian Fargo of Interplay Entertainment was among the few who didn’t agree with this point of view. He pitched a computer game to Paramount that would share a name with Konami’s efforts, but would otherwise be a completely separate experience. Aided by his natural charm and the relative disinterest of most of Interplay’s competitors, he made the deal. Disinterested competitors or no, it was quite a coup for his company, nowhere close to the largest or most prominent in its industry, to secure a license to make Star Trek games — especially given that the deal was made just months after Interplay had acquired the rights to another holy totem of nerd culture, The Lord of the Rings. While the Tolkien games would prove rather a disappointment, the Star Trek license would work out better all the way around. Interplay signed an open-ended contract with Paramount which allowed them to make Star Trek games all the way until the year 2000, with some significant restrictions: they would be subject to the studio’s veto power over any and all of their aspects, and they could be set only in the time of Captain Kirk and company’s first five-year mission. With these restrictions in mind, Interplay set out to make a game that would be slavishly faithful to the original television series’s format. Instead of a single epic adventure, the game would consist of eight independent “episodes,” each roughly equivalent in plot complexity and geographic scope to those that had aired on television back in the day. 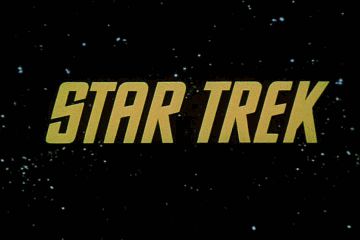 The structure of each episode would be the same: the Enterprise would be called upon by Star Fleet to handle some new crisis at the episode’s beginning, whereupon the player would have to warp to the correct star system and engage in some action-oriented space combat, before beaming down to the real heart of the problem and sorting it all out in the guise of an adventure game. Interplay noted that the episodic format could make for a refreshing change from the norm in adventure games, being amenable to a more casual approach. 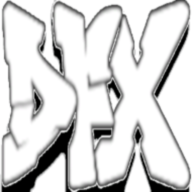 Each episode would be designed to be completable in an evening; after finishing one of them, you could start on the episode that followed the next day, the next week, or the next month, without having to worry about all of the plot and puzzle threads you left dangling last time you played. From Fargo’s perspective, the episodic structure also had the advantage that each part of the game could be designed without much reference to or dependence on any of the others; this made things vastly easier from the standpoint of project management. Fargo turned to a familiar source for the episodes’ scripts: Michael Stackpole, a member of the Arizona Flying Buffalo fraternity who had played a leading role on Interplay’s Wasteland CRPG and contributed to such other titles as Neuromancer. Stackpole had been busying himself recently with writing tie-in novels set in the universe of the BattleTech tabletop-game franchise. He thus thought that he knew what to expect from working with a licensed property, but he was unprepared for the degree of micromanagement that a bureaucratic giant like Paramount, stewarding one of the most valuable media properties of the age, was willing to engage in. He submitted scripts for fifteen episodes for a game that was anticipated to contain only eight, assuming that should surely cover all his bases; Interplay and Paramount could decide between themselves which eight they actually wanted to include. To everyone’s shock, Paramount outright rejected all but a handful of them weeks later, usually for the most persnickety of reasons. Interplay’s frustration was still evident in a preview of the game published much later in Computer Gaming World magazine, which noted that “the film studio decided against plot elements derived from episodes which were already part of the Star Trek legend.” With Stackpole having returned to writing his novels, Fargo brought in Elizabeth Danforth, another Flying Buffalo alumnus who had worked with Interplay before, to write more episodes and shepherd them through the labyrinthine approval process. All of this was happening during one of the most chaotic periods in Interplay’s history. Their distributor Mediagenic had just collapsed, defaulting on hundreds of thousands of dollars they had owed to Interplay and destroying the company’s precious pipeline to retail. The Lord of the Rings game, which was supposed to have been their savior, missed the Christmas 1990 buying season and, when it did finally ship early the following year, met with lukewarm reviews and disappointing sales. Only the strategy game Castles, an out-of-left-field hit from a third-party developer, kept them alive. Amidst it all, the team making Star Trek: 25th Anniversary kept plugging away — but, inevitably, the game fell behind schedule. September of 1991 arrived, bringing with it the big television special and the Nintendo Entertainment System game, but Interplay’s own tie-in product remained far from complete. It didn’t ship until March of 1992, by which time all of the anniversary hoopla was in the past. Interplay’s game had all the trappings of an anticlimax; it really should have been known as Star Trek: 26th Anniversary, noted more than one commentator pointedly. For those inside the company, the story of the game was taking on some worrisome parallels to that of their Lord of the Rings title: a seeming surefire hit of a high-profile licensed game that arrived late and wound up underwhelming everyone. They needn’t have worried. Star Trek: 25th Anniversary was a much more polished, more fully realized evocation of its source material than The Lord of the Rings had been, and it came at one of the Star Trek franchise’s high-water marks in popularity. Star Trek VI, which had hit theaters just three months before Interplay’s game, had become everything one could have hoped for from the original crew’s valedictory lap, garnering generally stellar reviews and impressive box-office receipts. Meanwhile The Next Generation was now in its fifth season on television and more popular than ever. 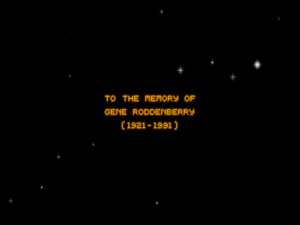 The only shadow over proceedings was the death of Gene Roddenberry, the creator of Star Trek, on October 24, 1991. Yet even that event was more help than hindrance to the Interplay game’s commercial prospects, in that it created an appetite among wistful fans to look back to the franchise’s beginnings. Interplay dedicated Star Trek: 25th Anniversary to Gene Roddenberry. Indeed, Star Trek: 25th Anniversary thrived in this febrile atmosphere of contemporary success tinged with nostalgia. It became the biggest Interplay hit since Battle Chess, selling over 250,000 copies in all and doing much to set the company’s feet back on firm financial ground after the chaos of the previous couple of years. The game continues to stand up fairly well today, with a few caveats. Undoubtedly its least satisfying aspect is the space-combat sequence that must be endured at the beginning of each episode. 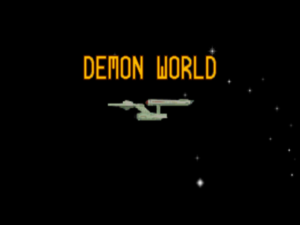 Perhaps not coincidentally, this is one of the few places where the game isn’t faithful to the spirit of Star Trek. Science fiction’s two most successful media franchises take very different approaches to battles in outer space: while Star Trek portrays its combatants as lumbering naval vessels, jockeying for position in a slow-paced tactical game of cat and mouse, Star Wars looks to the skies of World War II for inspiration, opting for frenetic dog fights in space. But 25th Anniversary goes all-in for Star Wars instead of Star Trek in this respect; the Enterprise turns into Luke Skywalker’s X-Wing fighter, dodging and weaving and spinning on a dime in response to the joystick. The reason for the switch can be summed up in two words: Wing Commander. Origin Systems’s cinematic action game of outer-space dog-fighting was taking the market by storm as Interplay was starting work on their own science-fiction game, and the company wanted to capitalize on their rival’s success. They described their game as “Sierra meets Wing Commander” at early trade-show presentations, and even made it possible to engage in randomized fights just for fun by visiting star systems other than those to which you’ve been directed, just in case the fighting you get to do in the episodes proper isn’t enough for you. That was quite the stretch; the combat in 25th Anniversary really isn’t much fun as anything more than an occasional palate cleanser, and it’s hard to imagine anyone voluntarily deciding to look for more of it. Not only does this part of the game clash with its faithfulness to Star Trek in just about every other respect, but it doesn’t work even on its own terms. The controls are awkward, it’s hard to understand where your enemies are in relation to you, and it’s simply too hard — a point I’ll be returning to later. For now, suffice to say that Star Trek: 25th Anniversary ain’t no Wing Commander. The worst part by far of Star Trek: 25th Anniversary. Thankfully, the rest of the game — the “Sierra” in Interplay’s pithy formulation — is both more engaging and more faithful to the Star Trek of old. When you leave the Enterprise‘s bridge, the game turns into a point-and-click graphic adventure, marking the first time Interplay had dabbled in the format since Tass Times in Tonetown back in 1986. You control Kirk directly, but Spock, McCoy, and some poor expendable redshirt also come along, ready to offer their advice and use their special talents when needed — or, in the case of the redshirt, to take one for the team, dying so that none of the regulars have to do so. The interface can be a little confusing at first; it’s not always clear when you should be “using” Spock or McCoy themselves on something and when you should be using their tricorders. But you start to get a feel for things after just a few minutes, and soon the interface fades into the background of what could stand on its own as a solid little graphic adventure — or, rather, eight solid little mini-adventures. Some of the puzzles can get a bit fiddly, but there are no outrageously unfair ones. The episodic nature of the game does much to make it manageable by limiting the possibility space you need to explore in order to solve any given puzzle; most of the episodes play out over just half a dozen or so locations. 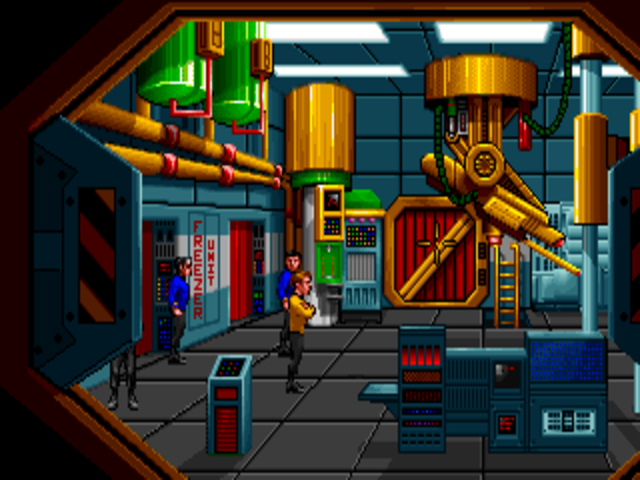 Still, what elevates a fairly workmanlike adventure game to something far more memorable is the Star Trek connection. This is clearly a game made by and for fans of the source material. If you count yourself among them, you almost can’t help but be delighted. The writers do a great job of evoking the characters we know and love; McCoy lays into Spock like the old racist country doctor he is, Spock plays such a perfect straight man that one can’t help but suspect that he’s laughing up his sleeve behind his facade of “logic,” and Kirk still loves to egg them both on and enjoy the fireworks. Star Trek: 25th Anniversary apes the look of its source material down to the title card that opens each episode. It’s true that the episodes work more on the level of pastiche than that of earnest attempts at storytelling — another reason that enjoying this game probably does require you be a fan of vintage Star Trek. Most of the scripts read like a Mad Libs take on the original series, mixing and matching its most familiar tropes. The crew has to shut down another misguided computer (a la “A Taste of Armageddon”), engage in some gunboat diplomacy with the Romulans (“The Enterprise Incident”), and negotiate an earthly religious mythos transplanted to another planet (“Who Mourns for Adonais?”). Harry Mudd, the intergalactic con man whose antics featured in two episodes of the original series, makes a third appearance here. Even Carol Marcus, scientist and Kirk paramour, shows up to foreshadow the major role she’ll later play in the movie Star Trek II. Star Trek: 25th Anniversary in its graphic-adventure mode. The gang’s all here, including the poor terrified red shirt hiding behind a pillar. If none of the interactive episodes can challenge the likes of “The City on the Edge of Forever” for the crown of Best of Trek, they’re certainly far less embarrassing than most of what the series produced during its painfully bad third season. They encompass the full tonal palette of the show, from screwball comedy to philosophical profundity. The graphic-adventure format does force a shift in emphasis away from dialog and action to more cerebral activities — the Kirk on television never had to slow down to solve set-piece logic puzzles like some of the ones we see here — but that shift is entirely understandable. Unfortunately, all of the good will the game engenders is undermined to a considerable extent by one resoundingly terrible design decision — a decision that’s ironically built upon a foundation of very good design choices. Each episode permits multiple solutions to most of the problems it places before you; this is, of course, a good thing. At the end of each episode, assuming you don’t get yourself killed, you receive an evaluation from Star Fleet Command in the form of a percentile grade. You’re rewarded with a better grade if you’ve managed to keep the poor redshirt who beamed down with you alive — this game’s writers show far more compassion for the expendable crew members than the original series’s writers ever did! — and if you’ve accomplished things with a minimum of violence — i.e., if you’ve kept your metaphorical and sometimes literal phasers on “stun” rather than “kill.” All of this too is a good thing, seeming evidence of a progressive design sensibility that’s become ubiquitous today, when countless games let you finish each scenario with a bronze, silver, or gold star, allowing you to be exactly as completionist and perfectionist as you choose to be. But now the bad part comes in. 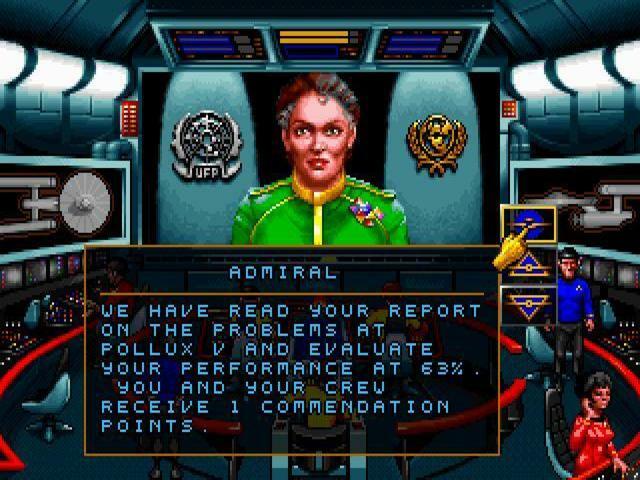 The final grades you receive on the episodes affect the performance of your crew during the remaining space-combat sequences, which themselves become steadily more difficult as you progress through the game. In fact, the final battle is so hard that you virtually have to have scored 100 percent on all of the preceding episodes to even have a chance in it. It turns out that the seeming easygoing attitude of the game, encouraging you to do better but letting you slide if you just want to move on through the episodes, has been a colossal lie, an ugly trap to get you 90 percent of the way to the finish line and then stop you cold. This is like a caricature of awful, retrograde game design — something even Sierra at their absolute nadir would have thought twice about. Either tell the player at the end of the episode that she just hasn’t done well enough and make her do it again, or honor your promise to let her continue with a less than stellar score. Don’t lie to her about it and then cackle about how you got her in the end. Pro tip: this is not good enough to get you through the game. Not only is this design decision terrible on its own terms, but it clashes with all of the implications of Interplay’s own characterization of Star Trek: 25th Anniversary as a more casual sort of adventure game than the norm, one that will let you play through a satisfying episode in a single relaxing evening. Interplay heard about this cognitive dissonance from their fans — heard so much about it that they begrudgingly issued an optional patch that let players skip past the combat sequences altogether by triggering a hot key. It wasn’t the most elegant solution, but it was better than nothing. This discordant note aside, the worst complaint you could make about Star Trek: 25th Anniversary in 1992 is one that doesn’t apply anymore today: that it was just a bit short in light of its $40 street price. And yet, worthy effort though Interplay’s first Star Trek game is on the whole, they would comprehensively top it with their second. Given 25th Anniversary‘s commercial success and the open-ended license Interplay had acquired from Paramount, a sequel was rather inevitable. There wasn’t much point in making bold changes to a formula that had worked so well. Indeed, when they made the sequel they elected to change nothing whatsoever on the surface, retaining the same engine, the same episodic structure, and even the same little-loved combat sequences. Yet when we peer beneath the surface we see the product of a development team willing to learn from their mistakes. As sometimes happens in game development, the fact that the necessary enabling technology was already in place in the form of an existing engine allowed design in the abstract to come even more to the fore in the sequel. The end result is a game that, while hardly a transformative leap over its predecessor, is less frustrating, more narratively ambitious, and even more fun to play. Although Star Trek: Judgment Rites continues with the episodic structure of its predecessor, it adapts it to a format more typical of television shows of the 1990s than those of the 1960s. An overarching “season-long” story arc is woven through the otherwise discrete episodes, to come to a head in a big finale episode. This gives the game a feeling of unity that its predecessor lacks. Even more welcome, however, is a new willingness within the individual episodes to move beyond pastiche and into some narratively intriguing spaces of their own. Virtually all of Judgment Rites‘s episodes, written this time by the in-house Interplay employees Scott Bennie and Mark O’Green in addition to the returning contractors Michael Stackpole and Elizabeth Danforth, mix things up rather than stick with the unbending 25th Anniversary formula of a space combat followed by Kirk, Spock, McCoy, and a semi-anonymous redshirt beaming down somewhere. Combat this time around is neither as frequent nor as predictably placed in the episodes, and the teams that beam down now vary considerably; Scotty, Uhura, and Sulu all get at least one chance of their own to come along and use their special talents. My favorite episode in Judgment Rites also happens to be the longest and most complex in either of the games. In Bennie’s “No Man’s Land,” a team from the Enterprise beams down to a planet which is being forced to reenact a simulacrum of Earth’s World War I by Trelane, the childish but almost infinitely powerful demigod who was introduced in the original-series episode “The Squire of Gothos.” As his inclusion would indicate, “No Man’s Land” is very aware of Star Trek lore. It’s plainly meant partially as an homage to the original show’s occasional “time-travel” episodes, like “Tomorrow is Yesterday,” “A Piece of the Action,” or “Patterns of Force.” These were beloved by fans for giving the familiar crew the chance to act out a bit in an entirely different milieu. (They were beloved by the show’s perpetually cash-strapped producers for another reason: they let them raid their studio’s stash of stock sets, props, and costumes). Yet “No Man’s Land” transcends homage to become a surprisingly moving meditation on the tragedy of a pointless war. Another standout is Stackpole’s “Light and Darkness,” a pointed allegory about the folly of eugenics. In addition to showing far more confidence in its storytelling, Judgment Rites also addresses the extreme difficulty of the space-combat sequences in its predecessor and the false promise that is letting you continue after completing an episode with a less-than-perfect score. You now have a choice between no combat at all, easy combat, and hard combat. The middle setting is calibrated just about right. Combat at this level, while still a long way from the likes of Wing Commander, becomes an occasional amusing diversion that doesn’t overstay its welcome instead of an infuriating brick wall that kills the rhythm of the game. And, at this level, moving on from any given episode with a score of less than 100 percent is no longer a fool’s gambit. Although a better game than its predecessor in almost every respect, Judgment Rites couldn’t muster the same sales. It didn’t ship until December of 1993 — i.e., almost two full years after 25th Anniversary — and by that time the engine was beginning to show its age. Nor did it help that Interplay themselves undercut its launch by releasing a “talkie” version of the first game on CD-ROM just a month later. That said, it’s not hard to understand Interplay’s eagerness to get the talkie version onto the market. In what can only be described as another major coup, Interplay, working through Paramount, brought in the entirety of the original cast to voice their iconic roles. At a time when many CD-ROM-based games were still being voiced by their programmers, it promised to be quite a thrill indeed to listen to the likes of William Shatner, Leonard Nimoy, and Deforest Kelley in the roles that had made them famous. The reality was perhaps a little less compelling than the promise. While no one would ever accuse any member of the show’s cast of being a master thespian in the abstract, they had been playing these roles for so long that doing so once more for a computer game ought to have presented little problem on the face of it. Yet they plainly struggled with this unfamiliar medium. Their voice acting runs the gamut from bored to confused, but almost always sounds like exactly what it is: actors in front of microphones reading lines on a page. It seems that none of them knew anything about the stories to which the lines related, which can only be construed as a failure on Interplay’s part — albeit one perhaps precipitated by the sharply limited amount of time during which they had the actors at their disposal. Over the course of a scant few days, the cast was asked to voice all of the dialog not for one but for two complete games; the voices for a CD-ROM version of Judgment Rites were recorded at the same time. And they had to do it all bereft of any dramatic context whatsoever. Somewhat disapointing though the final result is, these sessions represent a melancholy milestone of their own in Trek history, marking the last time the entire cast to the original show was assembled for a new creative project. As such, the talkie versions of these games are the last gasps of an era. Personally, though, I prefer the games without voices — not only because of the disappointing voice work but because Interplay chose to implement it in a really annoying way, with Kirk/Shatner saying each choice in every dialog menu before you choose one. Interplay, like most of their peers, was still scrambling to figure out what did and didn’t work in this new age of multimedia computing. Despite holding a license to the original series for the balance of the decade, Interplay would never return to this era of Star Trek after the talkie version of Judgment Rites shipped in March of 1994. Gamers and Trekkies were moving on, and the newer incarnations of the show were becoming, just as some had predicted they would, the default face of the franchise. To my knowledge, no Star Trek game since these two Interplay titles has revisited the original, classic show. This fact only makes 25th Anniversary and especially Judgment Rites all the more special today. That would make for a good conclusion to this article, but we do have one more thing to cover — for no article about Interplay’s takes on classic Trek could be complete without the media meme they spawned. Like a fair number of other memes, this one involves William Shatner, for more than half a century now one of the odder — and more oddly endearing — characters on the media landscape. Back when he was a struggling young actor trying to make it in Hollywood, it was apparently drilled into him by his agents that he should never, ever turn down paying work of any kind. He has continued to live by this maxim to this day. Shatner will do absolutely anything if you pay him enough: pitch any product, sing-talk his way through fascinatingly terrible albums, “write” a new memoir every couple of years along with some of the worst science-fiction novels in history. He’s the ultimate cultural leveler, seeing no distinction between a featured role in a prestigious legal drama and one in a lowest-common-denominator sitcom based on someone’s Twitter feed. And yet he manages to stay in the public’s good graces by doing it all with a wink and a nod that lets us know he’s in on the joke; when he goes on a talk show to plug his latest book, he can’t even be bothered to seriously pretend that he actually wrote it. He’s elevated crass commercialism to a sort of postmodern performance art. When the stars align, the kitschy becomes profound, and the terrible becomes wonderful. (“Why is this good?” writes a YouTube commenter in response to his even-better-than-the-original version of “Common People.” “It has no right to be this good.”) For this reason, as well as because he’s really, truly funny — one might say that he’s a far better comedian than he ever was an actor — he gets a pass on everything. At age 88 as of this writing, he remains the hippest octogenarian this side of Willie Nelson. In keeping with his anything-for-a-buck career philosophy, Shatner is seldom eager to spend much time second-guessing — much less redoing — any of his performances. His reputation among media insiders as a prickly character with a taste for humiliation has long preceded him. It’s especially dangerous for anyone he perceives as below him on the totem pole to dare to correct him, challenge him, or just voice an opinion to him. Like a dog, he can smell insecurity, and, his eagerness to move on to the next gig notwithstanding, he’s taken a malicious delight in tormenting many a young assistant director. Craig Duman, the Interplay sound engineer who was given the task of recording Shatner’s lines for the CD-ROM versions of 25th Anniversary and Judgment Rites, can testify to this firsthand. This incident would have remained an in-joke around Interplay’s offices had not an unknown employee from the sound studio they used leaked it to the worst possible person: morning-radio shock jock Howard Stern. Driving to work one morning, Brian Fargo was horrified to hear the outtake being broadcast across the country by this self-proclaimed “King of All Media.” Absent the “it sickens me,” the clip wouldn’t have had much going for it, but with it it was absolutely hilarious; Stern played it over and over again. Fargo was certain he had just witnessed the death of one of Interplay’s most important current projects. Thank to Howard Stern, Mystery Men, and the mimetic magic of the Internet, this William Shatner outtake has reached a couple of orders of magnitude more people than ever played the game which spawned it; most of those who have engaged with the meme have no idea of its source. If it seems unfair that this of all things should be the most enduring legacy of Interplay’s loving re-creations of the Star Trek of yore, well, such is life in a world of postmodern media. As Shatner himself would attest, just reaching people, no matter how you have to do it, is an achievement of its own. And if you can make them laugh while you’re about it, so much the better. (Sources: Computer Gaming World of December 1991, May 1992, March 1994, and May 1994; Questbusters of April 1992; Origin Systems’s internal newsletter Point of Origin of December 9 1991; the special video features included with the Star Trek: Judgment Rites Collector’s Edition. Online sources include Matt Barton’s interview with Brian Fargo and Fargo’s appearance on Angry Centaur Gaming’s International Podcast. Finally, some of this article is drawn from the collection of documents that Brian Fargo donated to the Strong Museum of Play.